Imagine losing a limb. Now imagine that on top of that loss, you feel pain, not just at the site of amputation, but in the missing limb itself as your brain tries to make sense of scattered signals. Researchers at the University of New Brunswick’s Institute of Biomedical Engineering are studying whether virtual reality helps patients quiet the signals that cause phantom pain. Today’s standard treatment for phantom pain uses mirrors to create the impression, from the patient’s perspective, of an intact limb. Over several sessions, the brain can, in essence, be tricked into believing the limb is there, quieting the signals causing pain. But it doesn’t work for everyone. Dr. Max Ortiz Catalan, founder of the Biomechatronics and Neurorehabilitation Laboratory at the Chalmers University of Technology in Gothenburg, Sweden, oversaw an initial study in 2016 which uses the same concept as mirror therapy, but leverages the immersion and flexibility offered by virtual environments. Dr. Sensinger discussed the idea with Dr. Catalan after a keynote lecture Dr. Sensinger gave at Cybathlon, an athletic competition for individuals with prosthetics, in Kloten, Switzerland in 2016. After hearing about the initial successes, Dr. Sensinger wanted to bring UNB in on the research. UNB is now the first to be holding trials on the potential treatment, for which worldwide clinical testing will be held. An effective therapy would benefit up to 70 per cent of amputees who experience phantom limb pain. Wendy Hill, a research occupational therapist at the Institute of Biomedical Engineering, is working with the first patients in this double-blind study. She and Dr. Sensinger were able to move quickly to join the study because of the unique support structure provided by UNB, including a responsive research proposal review process. Once the results of the broader study are analyzed, the hope is that within three to five years virtual reality therapy will become a viable replacement for mirror therapy, improving outcomes for patients with amputated limbs. Photo 1: Jon Sensinger, associate director of the the University of New Brunswick’s Institute of Biomedical Engineering, works in a lab at the institute. 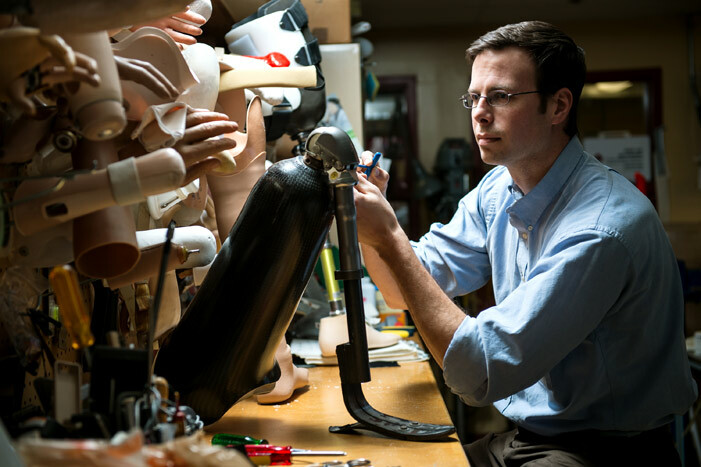 Along with other researchers, Dr. Sensinger is studying whether virtual reality helps ease phantom pain in those that have lost limbs. Credit: Rob Blanchard / Photo UNB. Photo 2: Wendy Hill, a research occupational therapist with the Institute of Biomedical Engineering at the University of New Brunswick (UNB), right, with client Trent Mundie of Fredericton. She is one of the researchers at UNB studying whether virtual reality helps ease phantom pain in those that have lost limbs. Credit: Rob Blanchard / Photo UNB.